First of all, I want to thank everyone for stopping by last week and leaving lovely comments on my Sewvivor audition. I am humbled and amazed to report that I made it in as a contestant in the top 16. To be quite honest, I didn't think I was going to make it, as the competition is quite fierce. I've come to the conclusion that the next little while will be fueled by coffee, adrenaline and very little sleep. I'll keep you posted on how things go. You can also follow along over at Family Ever After. In other stitchy news, I've been bitten. 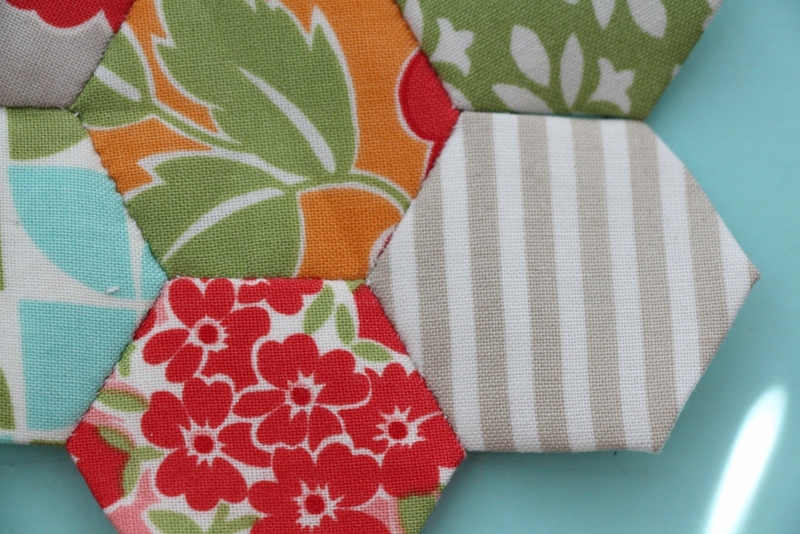 I held off for so long, but my Instagramming crafty friend, M, of Three Owls finally convinced me to take the plunge into the hexie (hexy??) world. And I finally quelled the fear and did it. And guess what? I'm hooked. 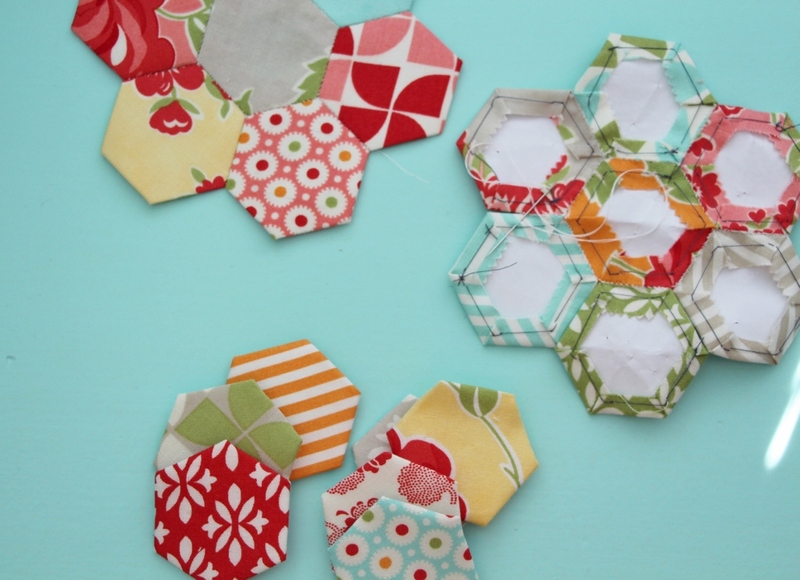 I can't get over how satisfying hexagons are! Also, I love the hand-sewing aspect. Take three minutes of basting and you get a little instant shot of cuteness. I suspect you'll be seeing more of these in the months to come. 1. I love thread basting. I can't imagine using glue, but will try it when I get the appropriate glue for educations sake. 2. Take small bites if you don't want your threads to show through on the top of the hexagon. my first hexagon flower - see the little stitches? 3. Using enough thread tension (pulling stitches nice and tight) when stitching the hexagons together also helps reduce thread showing through the top. And that's it for now friends. Thank you for stopping by. I'm off to go tackle my ridiculously long crafty to do list. 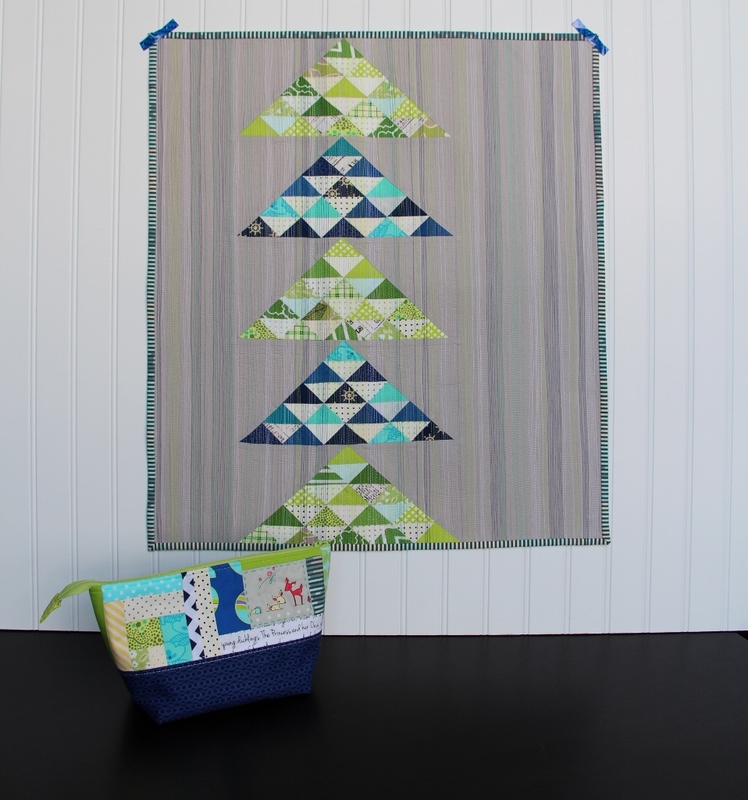 In true typical me fashion, I managed to finish my quilt for the Michael Miller Petal Pinwheels Challenge hosted by the Modern Quilt Guild just in time. Just. 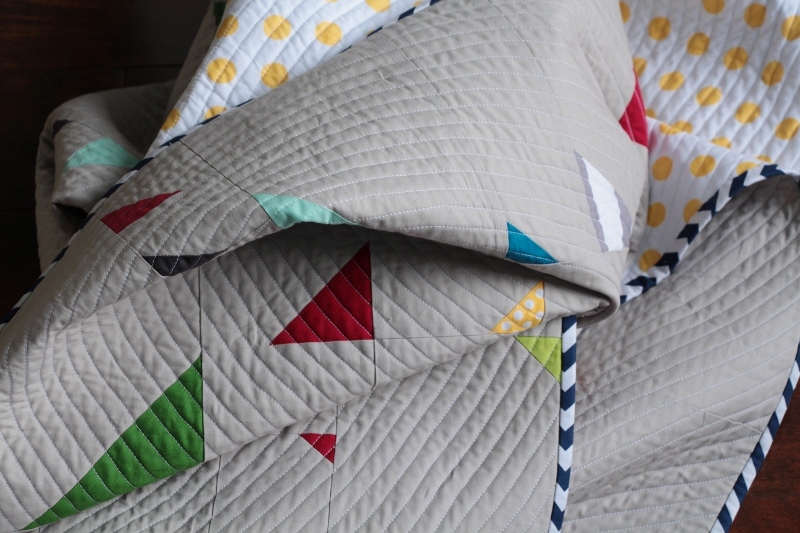 The idea for this quilt came to me while up with my youngest in the middle of the night. It's one of those flash ideas I seem to get, and I have to write it down or I forget it. I love these kinds of inspiration moments. Even if it means being up at three and four AM. I'm pretty sure we've all heard of the game girls play while pulling petals off a daisy or flower. He loves me, he loves me not.... he loves me (if you're lucky). The fabrics for the challenge reminded me of this game. And I really wanted to create the feel of petals falling. If you counted there are exactly twenty-one petals (some species of daisies have this number), and "he loves me" was born. The background is nice solid gray from Kona. 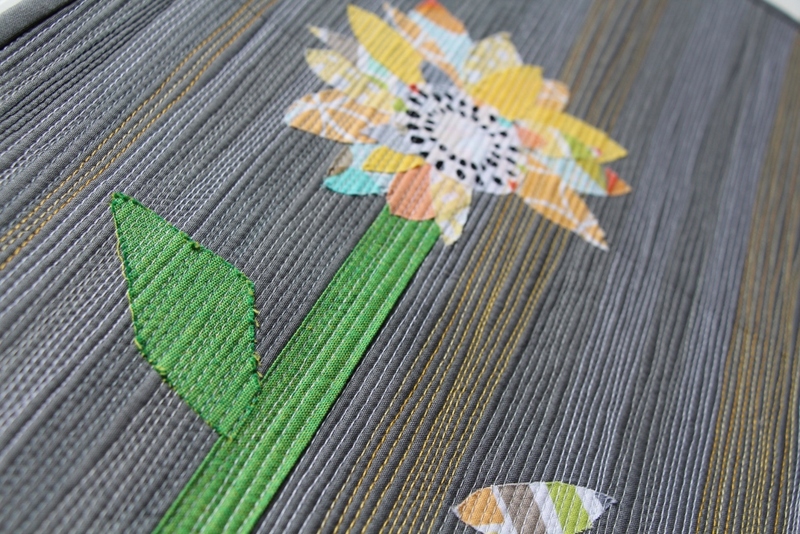 I've included a few petals of other solid varieties and have used a shot cotton for the grass and stem. 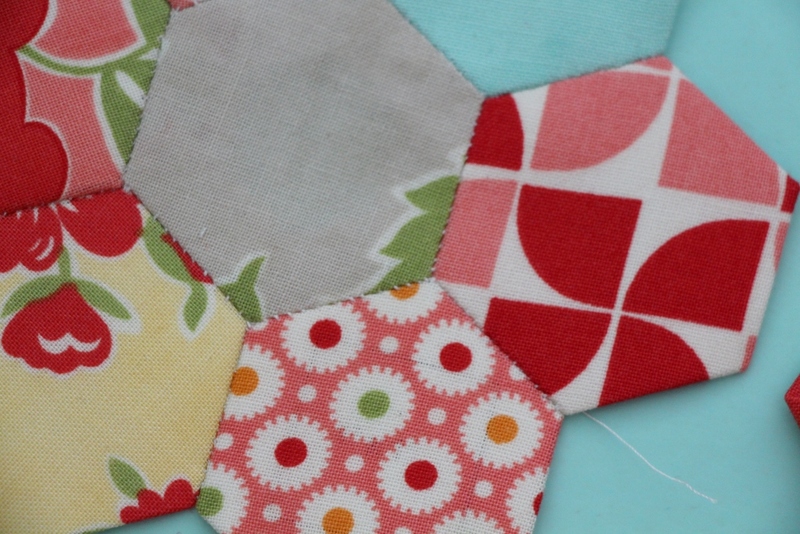 The only pieced item in this whole quilt is the stem and background. Everything else was "appliqued". I use this phrase lightly because I'm not sure what I did can really be called applique, so much as flying by the seat of my pants and hoping it turns out ok. 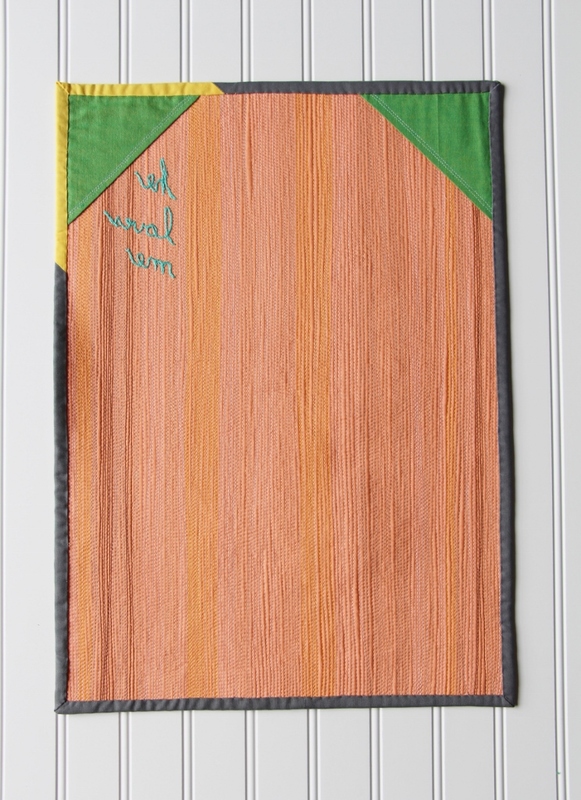 I did buy some thermoweb with the intention of doing real applique, but in the end, I decided I really didn't want a "polished" look to the finish. I wanted it raw and thready and organic. Needle-turned would be too perfect, and interfacing would be too chunky. 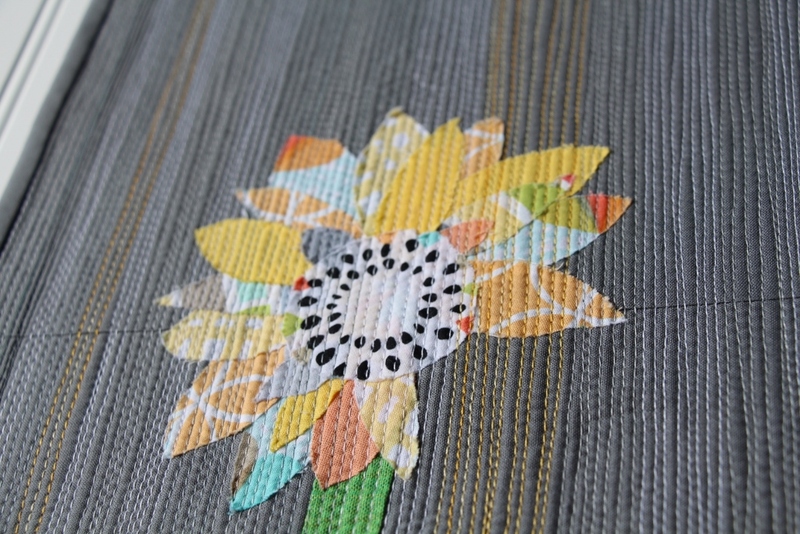 So, after hand cutting the petals, I used a fabric glue stick, positioned them, tacked them down, and sewed over top with my quilting stitch once everything was all layered together. 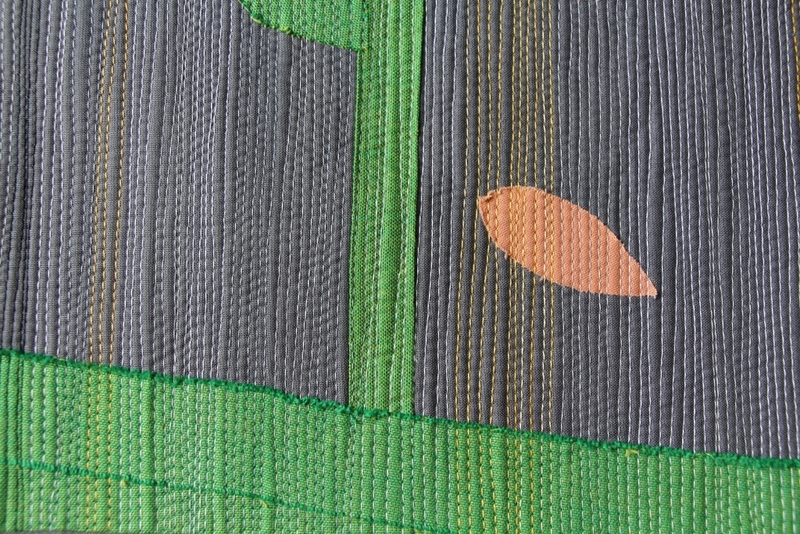 The matchstick quilting served as my applique process. Even the grass was glued down. I'm not sure if this is lazy or creative, but it fit my end goal and the quilt isn't too thick or stiff. I am really pleased with how it turned out. 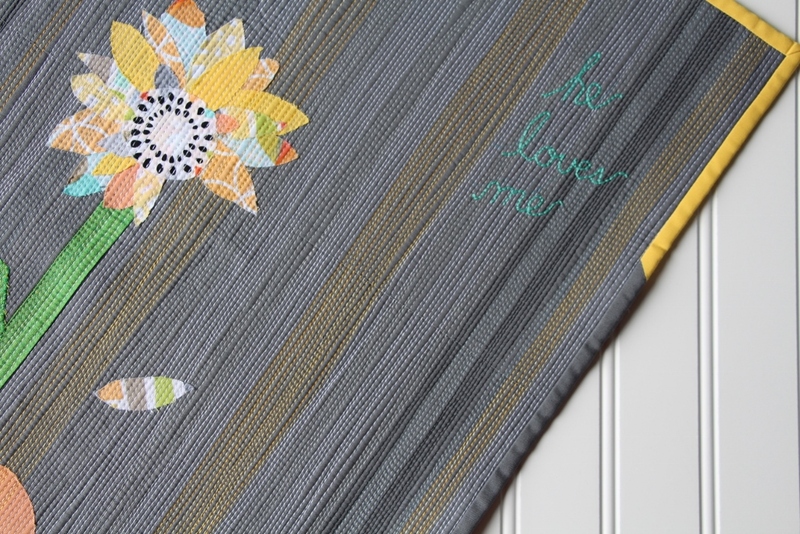 I used several Aurifil threads to do the quilting, both light and dark gray, some black and white and a gorgeous variegated yellow. Before binding, I added a bit of hand embroidery (for those taking notes, hand-stitching over top of matchstick quilting is somewhat tricky but doable). A little creative binding, and we're done. It measeures 20.25" x 14.5". I'm so happy with the way this turned out. 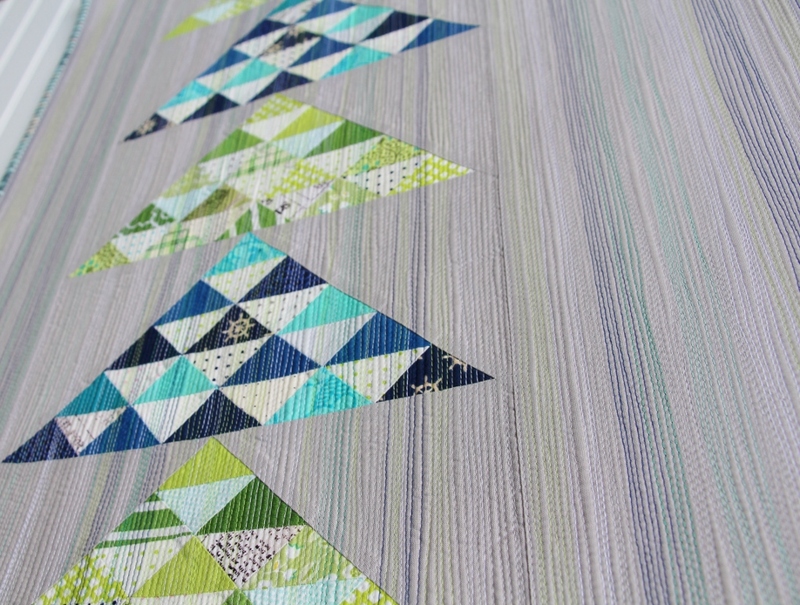 Linking up for finish it up Friday over at Crazy Mom Quilts. This has been an epic year of crafting for me and I'm really excited and really nervous about this post. 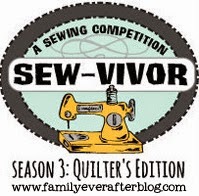 I've decided to enter the "Sewvivor - Quiters Edition", hosted by Rach at Family Ever After. I've mulled it over and was really torn between several finishes in the past six months. 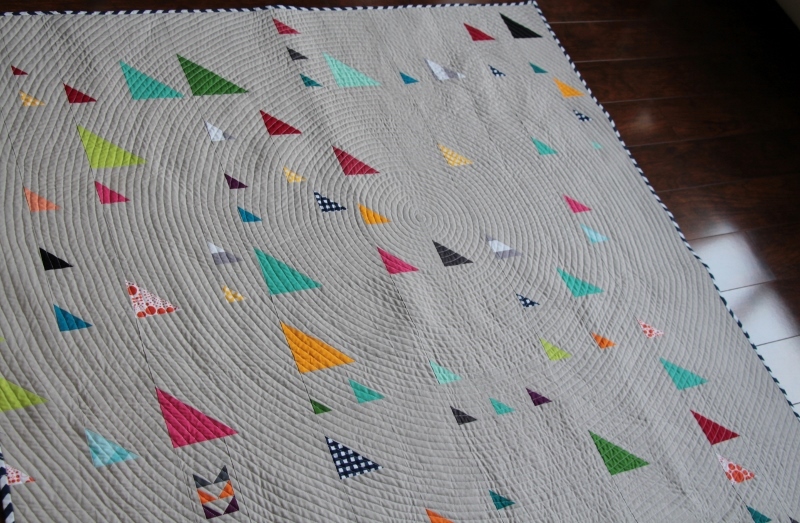 I've finally narrowed it to my 'up, up and away' quilt (it just narrowly beat out gravity). This is a very special quilt to me. 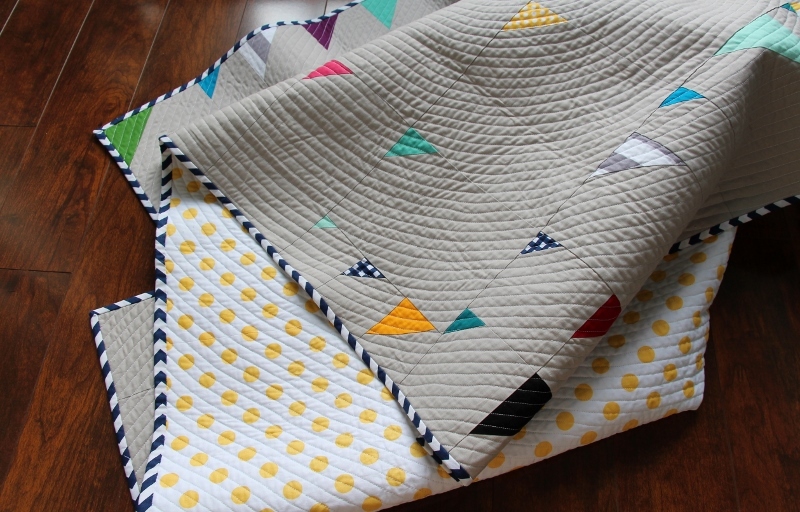 It is my youngest's first big boy quilt, my first ever challenge quilt for the Modern Quilt Guild, and the first pattern that I've ever drafted from scratch and made. 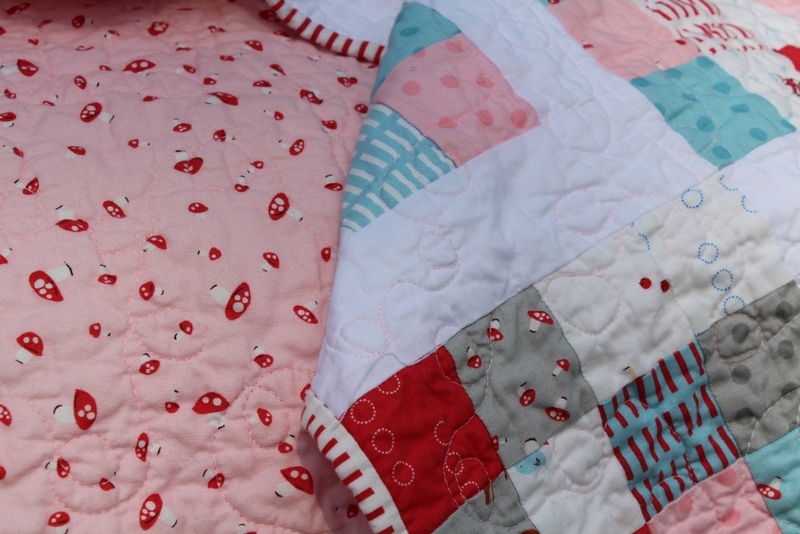 It's the quilt that made me begin to think I might, maybe, just maybe, have a shot of entering the quilt design and pattern making world. I think this is also my first truly "modern" quilt. 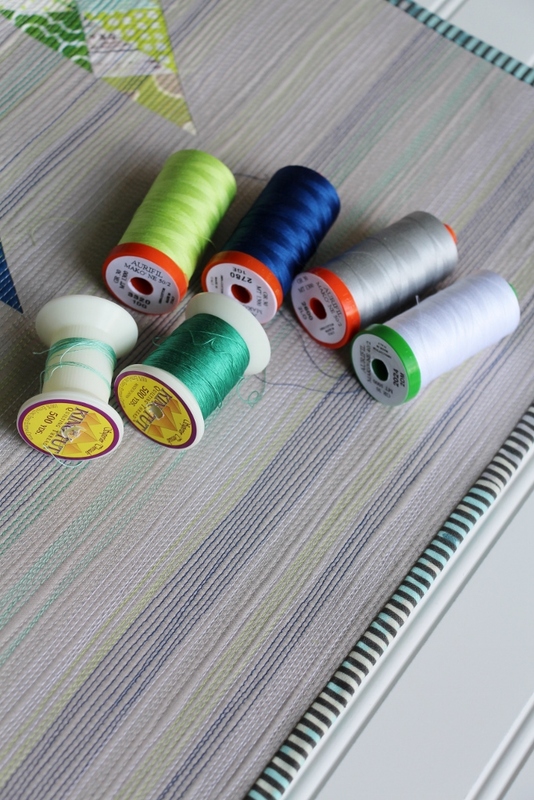 As I find my way in the quilting world, I'm learning that at heart, I seem to lean towards the modern with a happy helping of traditional mixed in. I quilted it in a spiral - it adds so much movement and texture to the quilt. While it does take a long time, the effort is worth it. And it makes me want to quilt everything in a spiraling pattern. 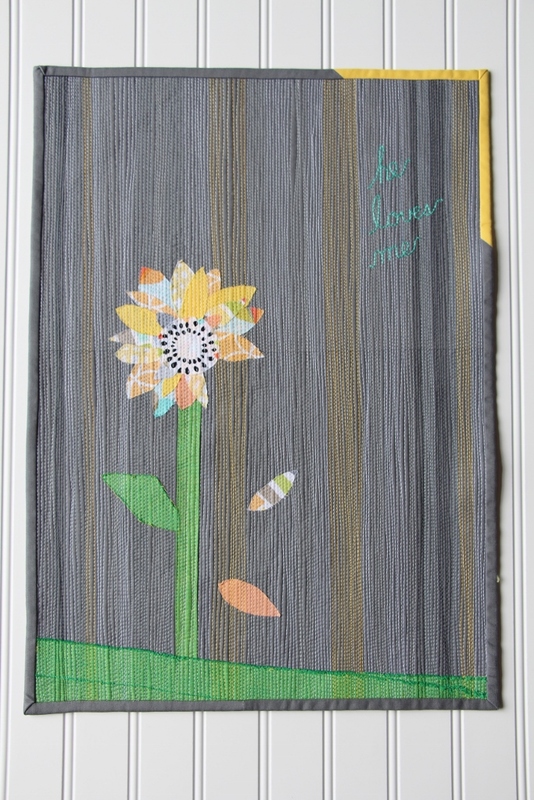 From the time this quilt was finished and bound (and even before), it has been loved by my son. He sleeps with it every night, and it sometimes makes the occasional trip to the beach. It means SO much to me to that he likes it and that it's both artistic and functional. And one of these days (as soon as I clone myself, or stay up all night), I'll move the pattern from my sketchbook to the digital world. I can't wait. 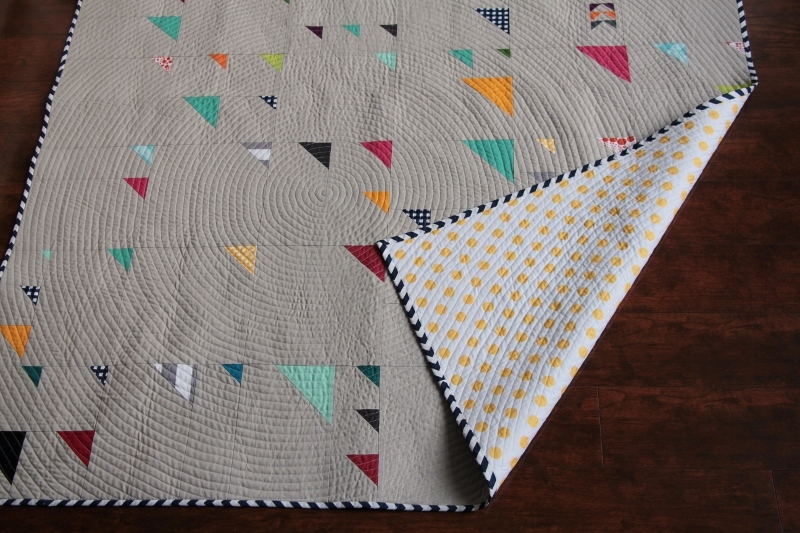 This quilt is defines what quilting is to me, it's the beginning and it's the future. I really hope you like it too! 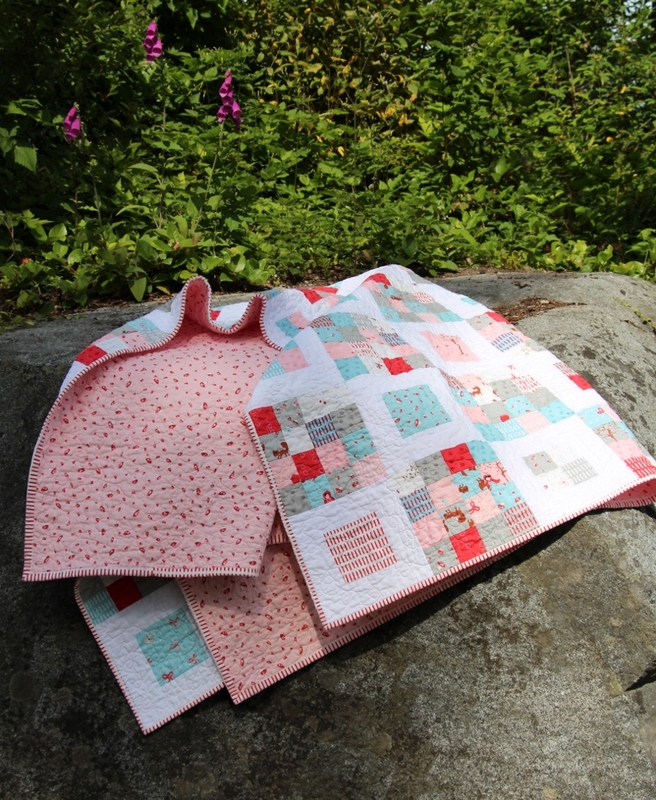 For quilting, I used an all over loop pattern and pale pink thread. 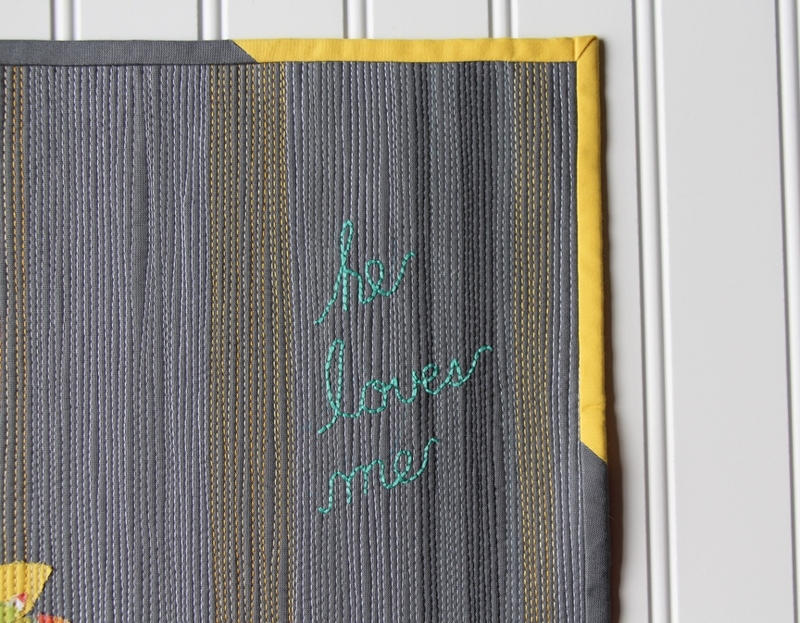 And I learned to make sure you have enough thread for a project, BEFORE you start the quilting. 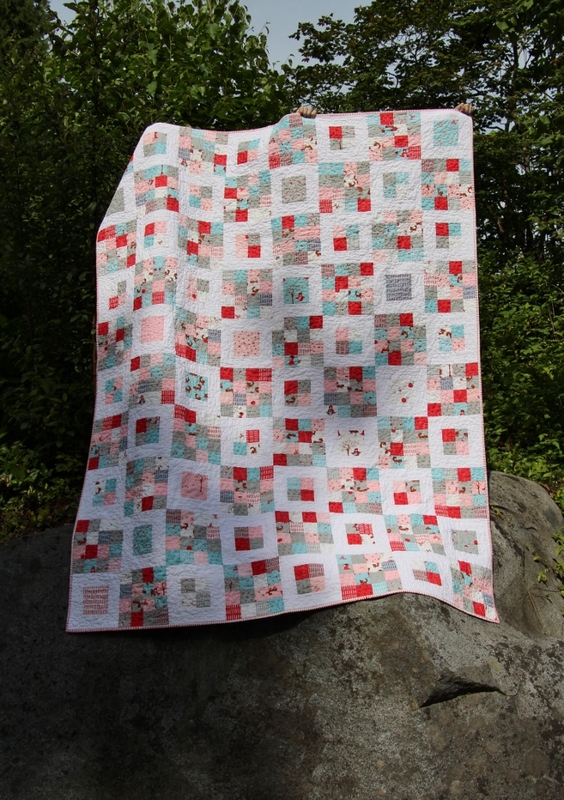 I backed it in this pink and mushroom Walk in the Woods fabric. It's just so pink - my daughter loves it. For binding, I was able to find a bit of yardage of my favorite red and white stripe from the same line. 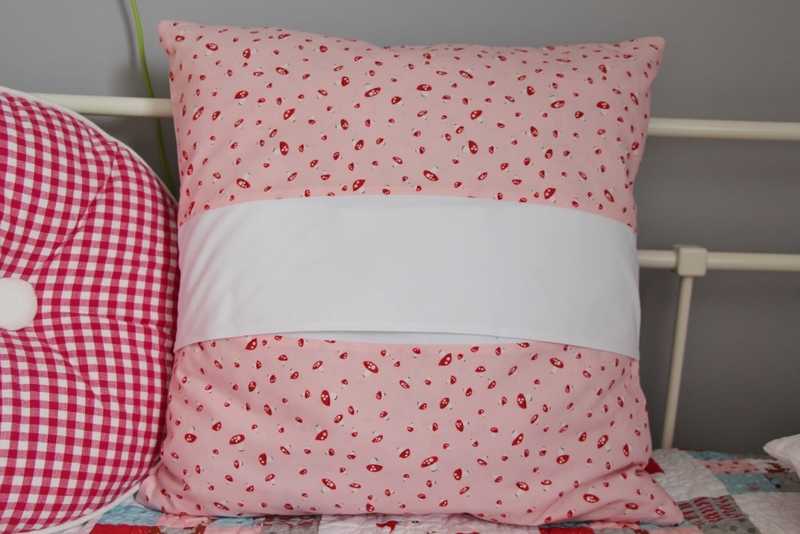 I've wanting to try my hand at pillow and pillow form making. 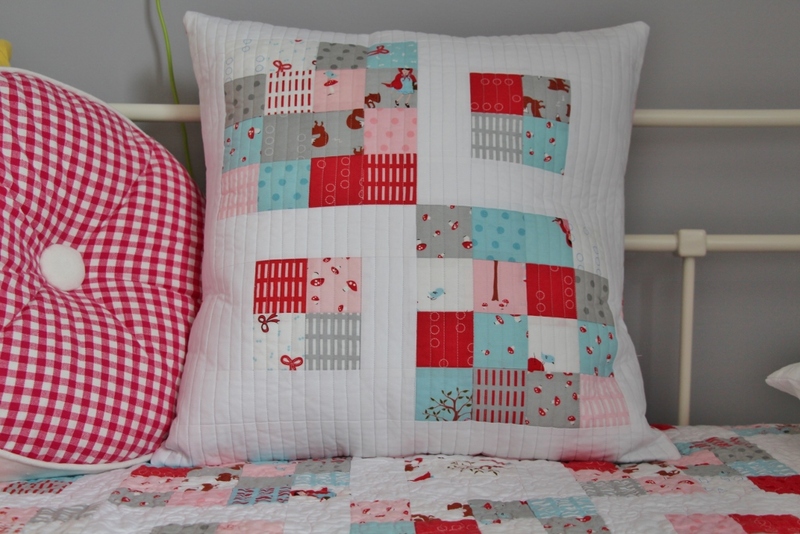 I had a few extra blocks from the quilt top, so I made a pillow front and quilted it with a straight -line pattern. 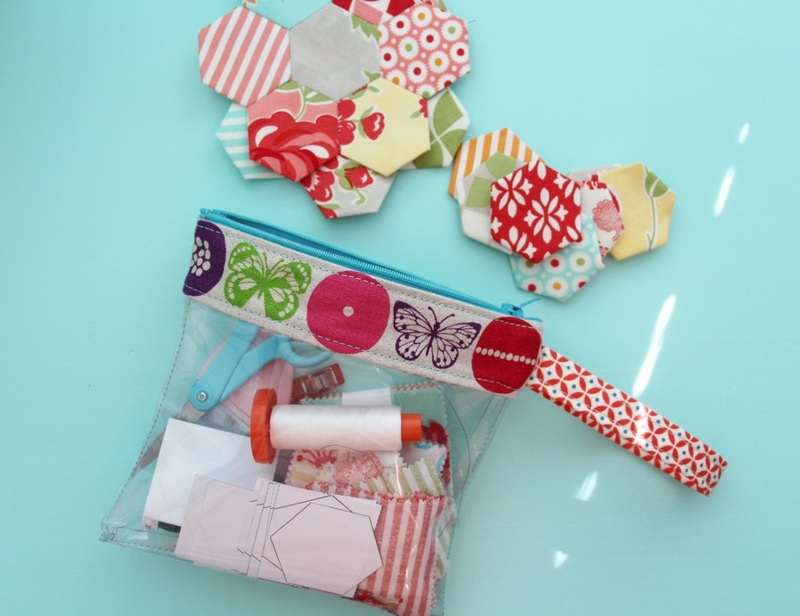 I followed the lovely tutorials from here for how to make the envelope back and here for how to make a pillow form. 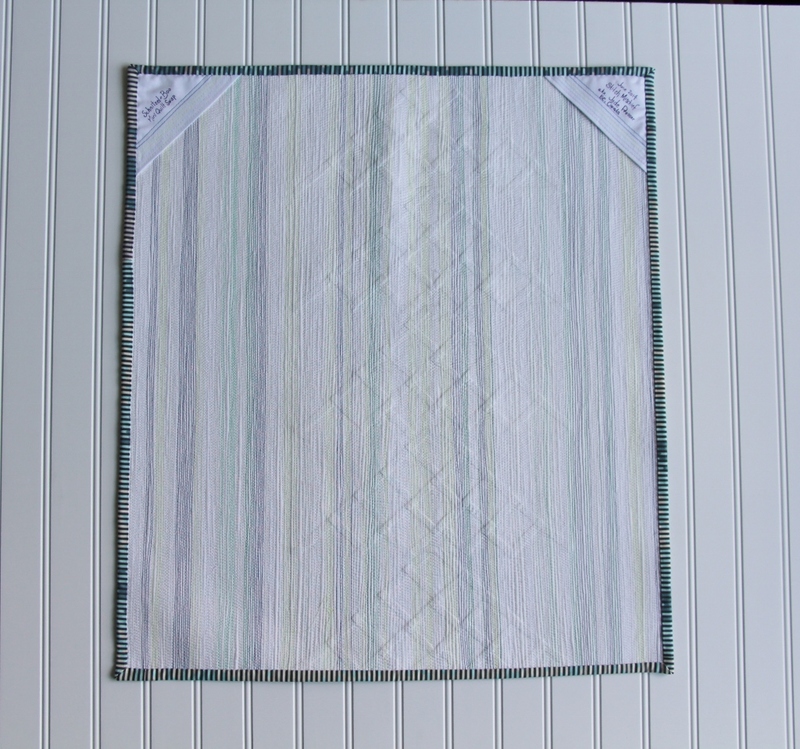 In my case, I had to jerry-rig the back of the pillow as I wanted to use all the leftover edges of the quilt backing. I added four panels of white, also from the scrap bins, and it all worked out. And finally here it is, all washed and dried and crinkled and loved. Thanks for stopping by! Today I'm linking up with Amanda Jean for finish it up Friday. 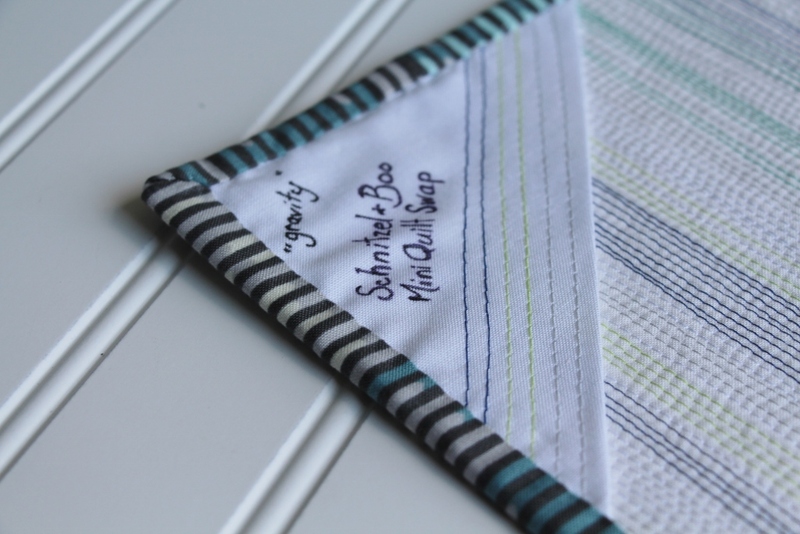 Back in the May, I joined a project called the Schnitzel and Boo mini quilt swap. I have never done anything like this before and was intrigued. The photos of the previous round looked great. The thought of making a mini for someone I had never met, designed just for them, was the sort of challenge I couldn't resist. 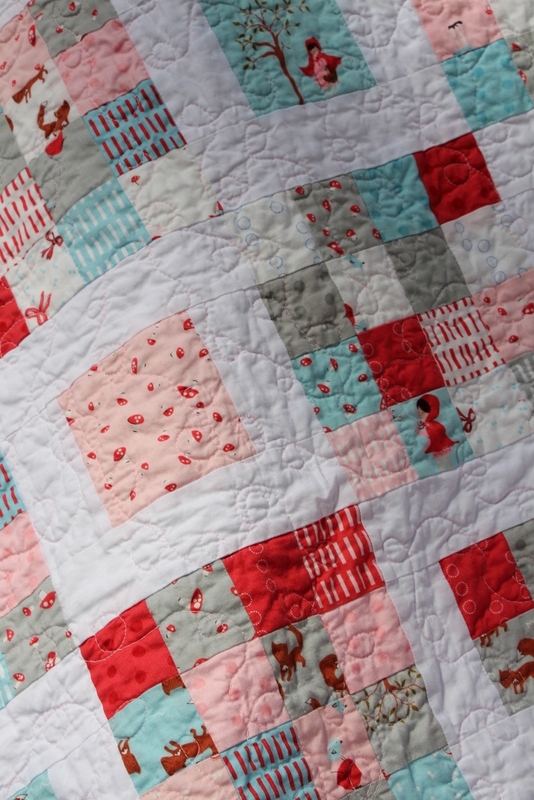 If you follow me on Instagram, you'll be sick of seeing this quilt. But I wanted it documented, so here you go. 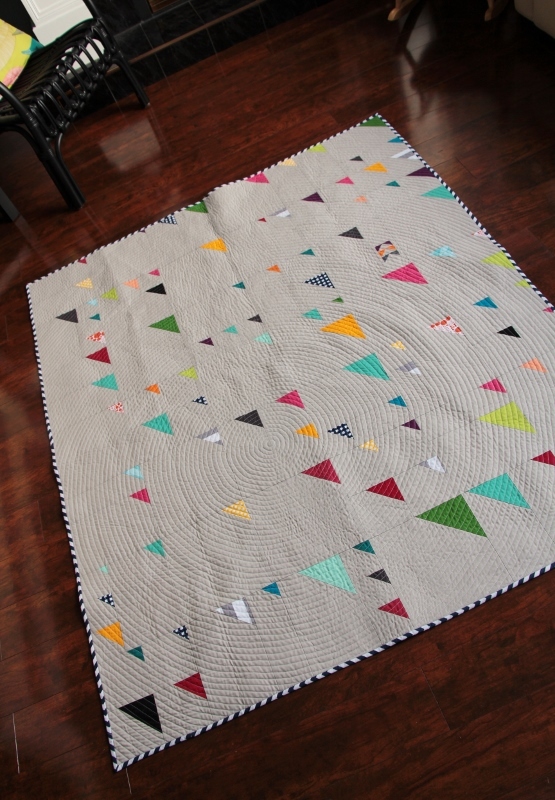 The quilt is still in transit, but don't worry, no spoilers here. I'll update later when the person receives it, hopefully with a picture. After some careful studying of my unsuspecting recipient, I decided to go with a modern, clean-lined design, using cool blues and limes on a warm grey. I love grey as a background. It's a recurring thing. 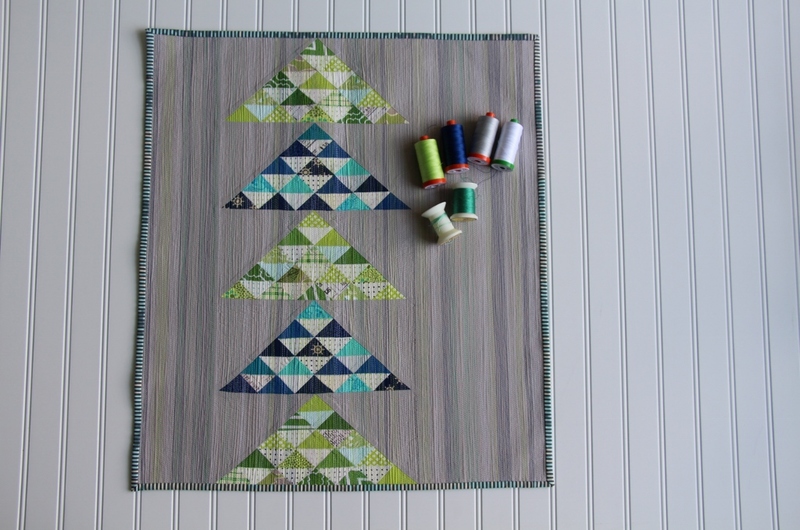 I designed a pattern of five flying geese constructed out of half square triangles, three green based and two blue based. 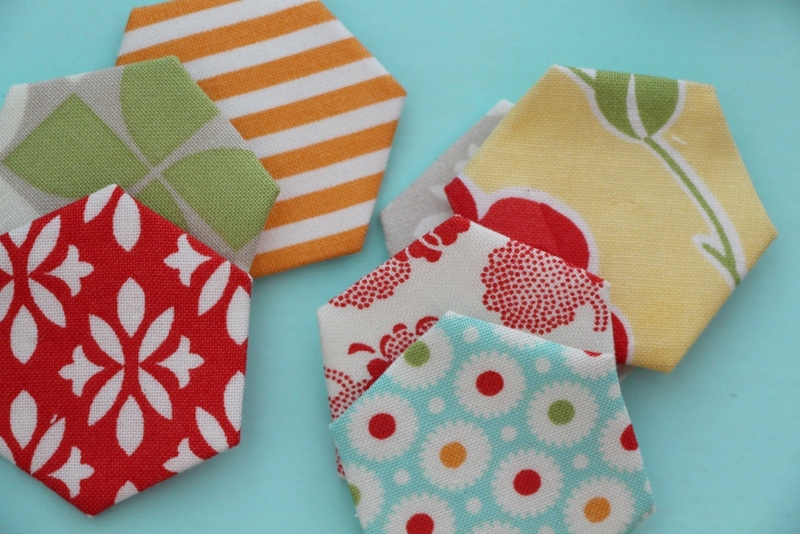 The lighter parts of the squares are low volume fabrics. Most of this was generated from scraps, which feels awesome. Oone or two prints as well as the grey were from my stash. 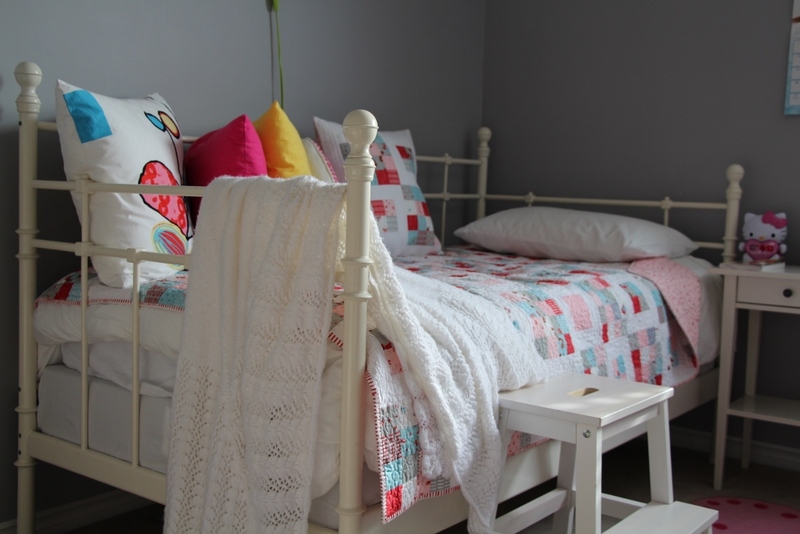 The simplicity of the design and the my study of the recipient called for some serious fun in the quilting department. 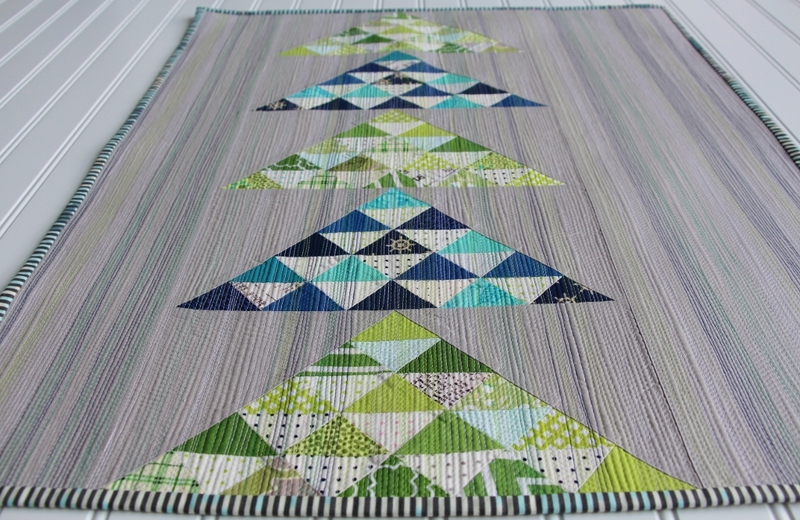 This is my first time trying "matchstick quilting" after admiring it on several other quilts recently. It's like painting with thread. I love it. I used a couple different weights and six different colors. I like how the backing turned out too. Its name is 'gravity', a play on the flying geese and the movement in the thread. Needless to say, I had a really hard time parting with it on Monday. I hope it's new owner loves it as I so loved making it for them. Linking up for finish it up Friday with Amanda Jean.